Police in India say they have killed a top Maoist guerrilla who was wanted in connection with a train crash in May that left 150 people dead. The body of Umakanta Mahato was found in a jungle in West Bengal state after security forces clashed with rebels. Police had announced a cash reward for his arrest. They have described his killing as "a major success". 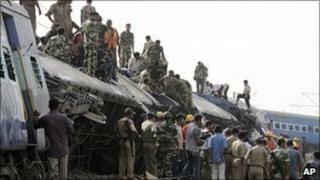 The train crash, said to be an act of sabotage, was blamed on the Maoists, but the rebels denied being involved. Police say the PCPA activists, led by Umakanta Mahato and Bapi Mahato, sabotaged the train track that caused the derailment of the Calcutta-Mumbai express near Jhargram on 28 May. The Maoists say they are fighting for the rights of the poor and the landless. PM Manmohan Singh has described the Maoist insurgency as India's biggest internal security challenge. Mahato, a leader of the pro-Maoist militia Peoples' Committee against Police Atrocities (PCPA), was found dead in the jungles of Lodhashuli in Jhargram district on Friday. "This is a major success but it would have been better for the investigations if Umakanta Mahato was captured alive," West Bengal police chief Bhupinder Singh said. India's federal police - the Central Bureau of Investigation which is investigating the train disaster - has announced cash rewards of 100,000 rupees ($2,135) for the arrest of the top suspects.